It’s black. And white. And it warbles. Guess who’s our August 2015 bird in our 12 Month of Birding series on the blog? You guessed it — the Black-and-white Warbler! This is one of Innkeeper Brigette’s favorite birds, which is saying a lot because she has a teensy bit of a bird phobia. But who can resist smiling when the happy whistling song of the Black-and-white Warbler starts being heard in springtime as this beautiful bird makes its way to the North Carolina mountains from its winter home in Florida, central America and South America? The Black-and-white Warbler is easy to identify…a boldly striped black and white head and body, long black wings with two white wingbars, and a short tail. 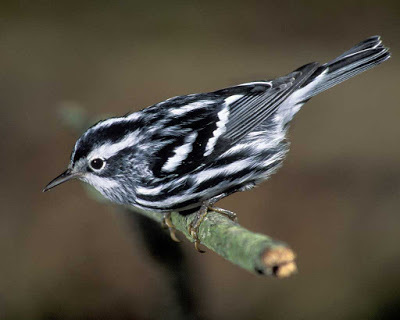 In terms of size, the Cornell Lab of Ornithology states that the Black-and-white Warbler is larger than a chickadee but smaller than a nuthatch. Black-and-white Warblers love Pisgah National Forest around the Inn on Mill Creek and can be seen in many nearby spots, including woodsy areas on the Blue Ridge Parkway and also at Chimney Rock State Park. Fun fact: You will likely see them mostly in trees, as they forage up and down tree trunks like nuthatches, in search of insects, but they actually build their nests on the ground at the bases of trees and rocks or under shrubs. This entry was posted in Birding in the North Carolina Mountains and tagged 12 Months of Birding at the Inn, birding, Blue Ridge Parkway, Pisgah National Forest, Summer by Inn on Mill Creek. Bookmark the permalink.